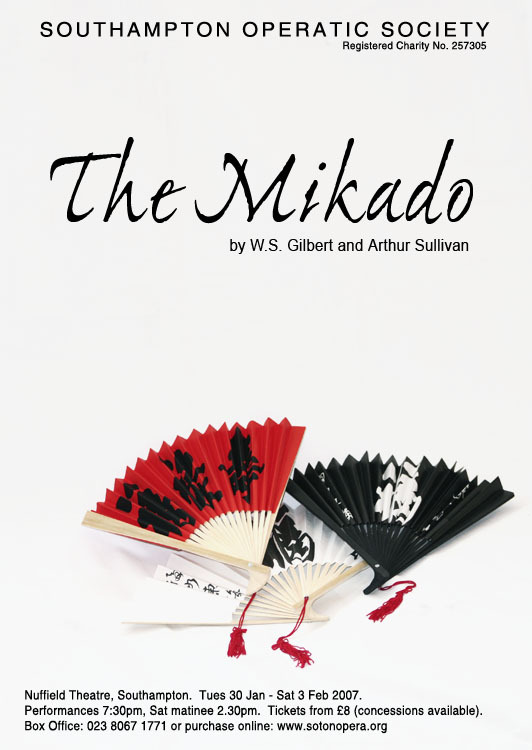 After they had worked together on Princess Ida, Gwen Moulster remarked on how imaginative and full of ideas Richard Peaty (her assistant) had been and the Society was about to discover exactly how true that was when he accepted the offer to direct The Mikado. Initially Paul Spanton was the MD, but a health concern led to Martin Paterson taking over soon after the principal auditions. 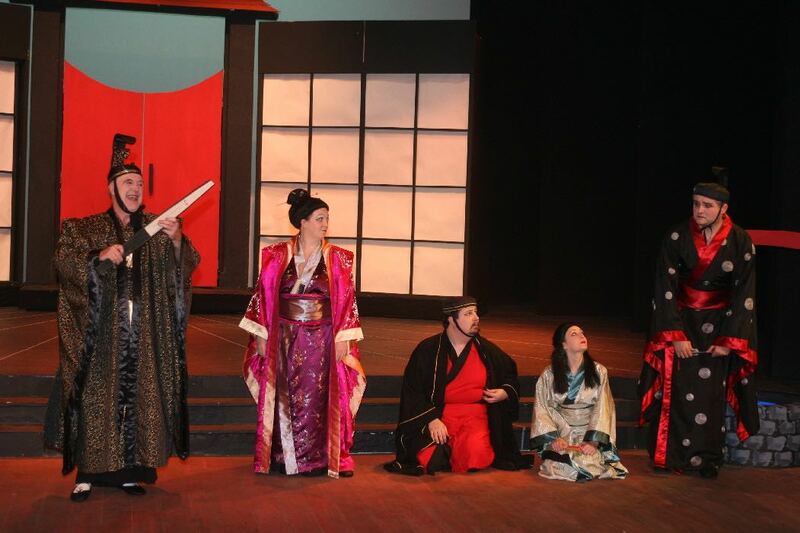 Richard’s imagination saw the men’s chorus wearing red kimonos and the ladies white, nothing too startling there, but when they appeared on stage together in the Act 1 Finale, the colours of the Japanese flag suddenly became obvious. Fans dominated the action, the moves were carefully choreographed and, in the opening number, the men even used them as semaphore flags. The set was minimalist but the floor was marked with white perspective lines disappearing into the distance, giving the impression that the stage was much larger than in reality. 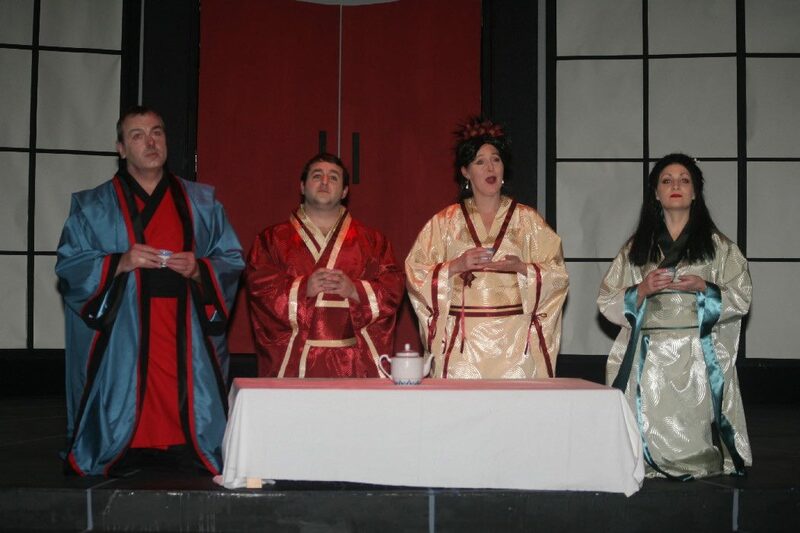 The Echo reviewer obviously appreciated Richard’s vision: ‘All of the leads were strong but Nick Hollands (Ko-Ko) and Mike Pavitt (Pooh-Bah) stole the show with their comic characterisations, particularly when joined by David Rayner (Pish-Tush) in “I Am So Proud”. 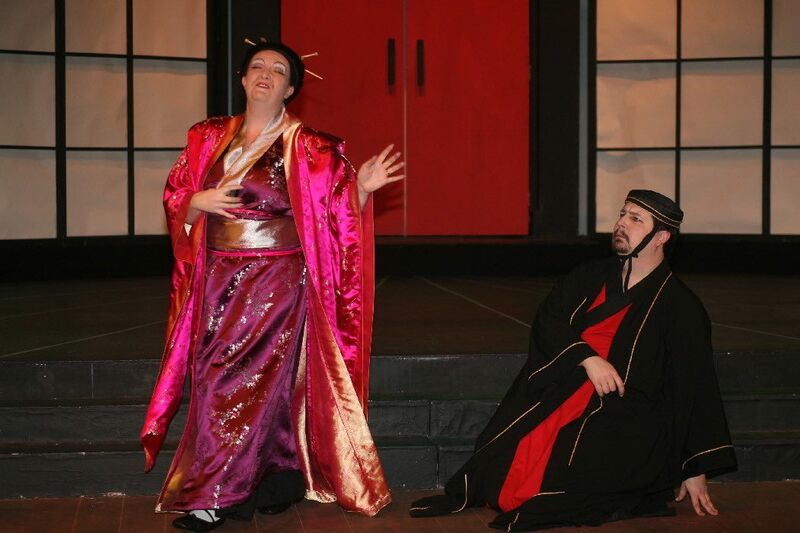 The costumes were authentic and the simple set was used creatively, enhanced by clever use of lighting. Gillian Parry’s choreography made excellent use of the stage and if synchronised fan waving were an Olympic event then the SOS chorus would win a gold medal! Director Richard Peaty has put on a slick and upbeat show, which succeeded both visually and musically.’ Having established that the principals were good and then only mentioning three of them, it is worth recording who the others were; Ralph Bateman (Nanki-Poo), Alison Vincent (Yum-Yum), Vicky Wilson (Pitti-Sing), Katy Lewis (Peep-Bo), April Leuscher (Katisha) and Colin Sly (The Mikado – for the third time, also 1997 and 1983). 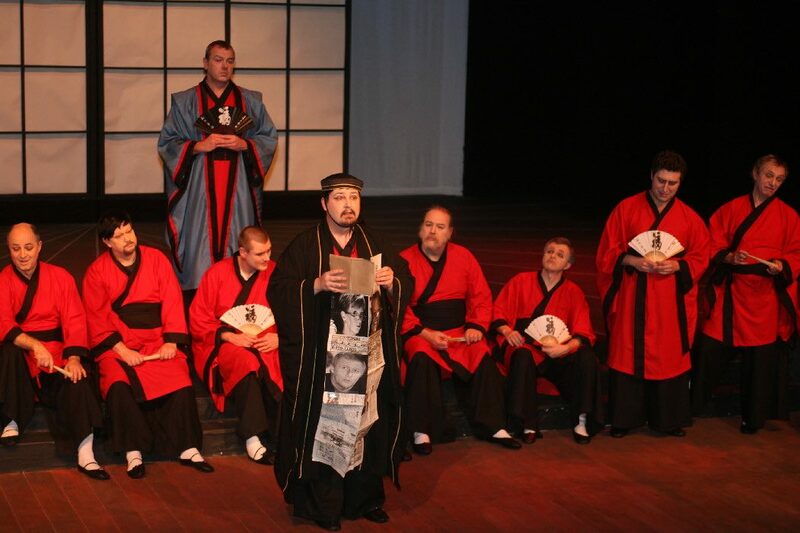 In a review for WOS, Vernon Tottle remarked: ‘This wasn’t just a performance of The Mikado; it was a brilliant show that illustrated exactly how a traditional production of a well known piece can be made exciting for the most seasoned of G&S devotees.’ The Committee regretted the decision not to take the production to Buxton. The Nuffield showed that proof-reading was not a strongpoint as their brochure contained two errors about the show that resulted in them sending out an extra 650 letters with the correct details. The extra publicity must have had an effect because tickets moved much faster than usual. All performances were soon sold out but a mistake at the box office resulted in 50 seats being sold twice for one evening – the overture was put back while the staff found enough stools to accommodate everyone. 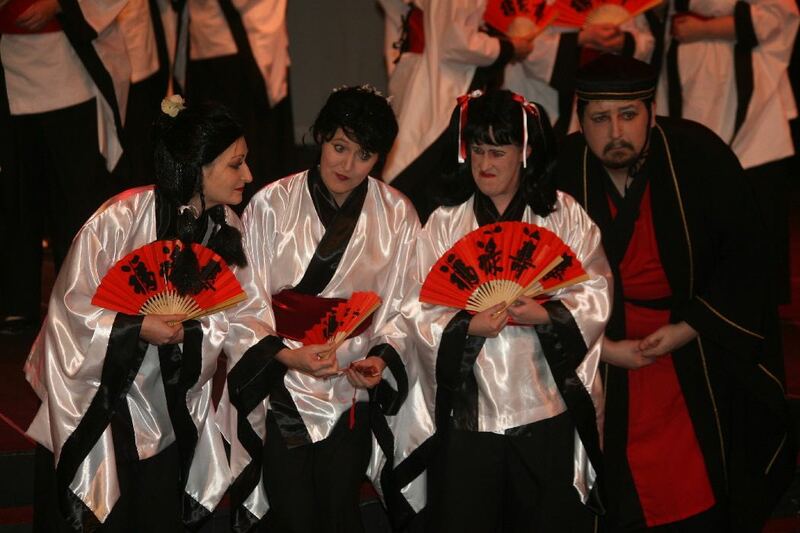 Prior to 2007, SOS had put on a production of The Mikado nine times (at least once every decade) and, on each occasion, it had made a profit – the total gain from all nine (and performing in Austria) stood at £6608. 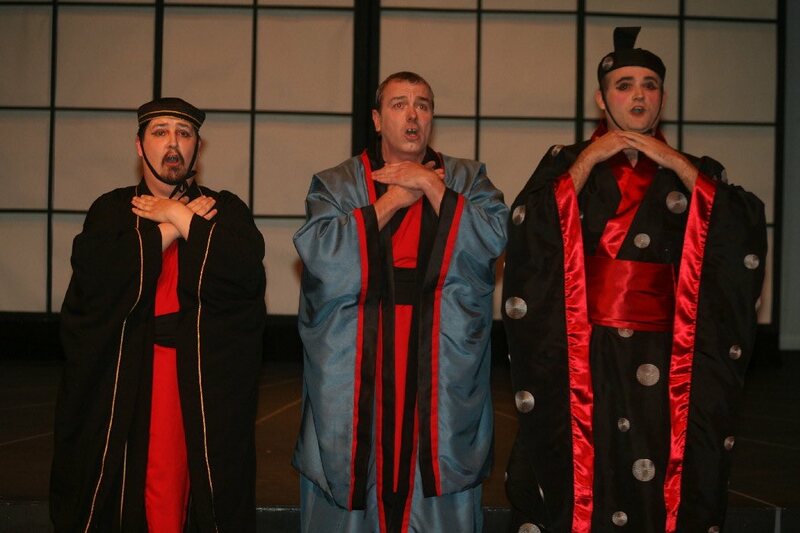 Amazingly, this The Mikado eclipsed that total, earning the Society £9541.